The Zebra P420i Printer System has been discontinued. No direct replacement is available. 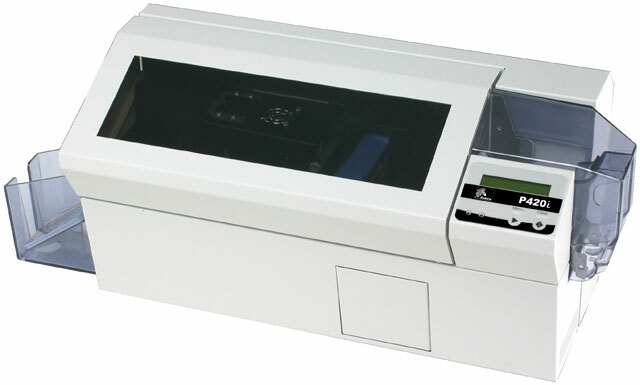 The Zebra P420i Printer System is a high-performance ID card printer that can print 102 cards per hour (35 sec/card). The P420i Printer System features parallel, USB and Ethernet interfaces so it's simple to add to any existing computer station, and with 4 MB of memory detailed card designs (including barcodes) are easily produced. The P420i Printer System features YMCKOK printing at a 300 dpi resolution, plus an included card flip-over feature to enable double-sided printing on every card. For high-quality, high-performance ID card printing needs, the Zebra P420i Printer System is an excellent value.